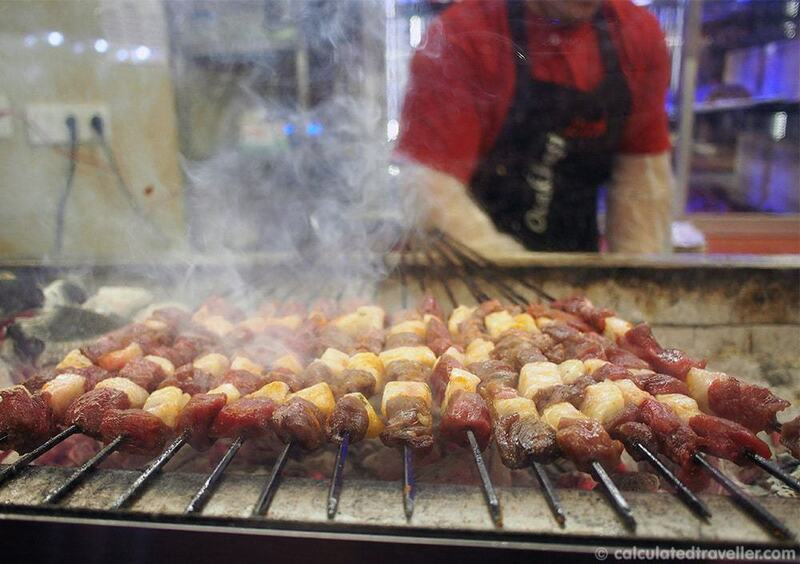 The best way to learn about a city, country or culture, in my opinion, is through their food culture and food scene. We may not look the same or speak the language, but we can all come together so to speak through the simple act of “breaking bread” with one another. That’s why I LOVE food tours. You get the opportunity to explore the farmers market, go to great restaurants, sit in cafés and bars to do as the local (insert country here) would do on an afternoon or evening out. 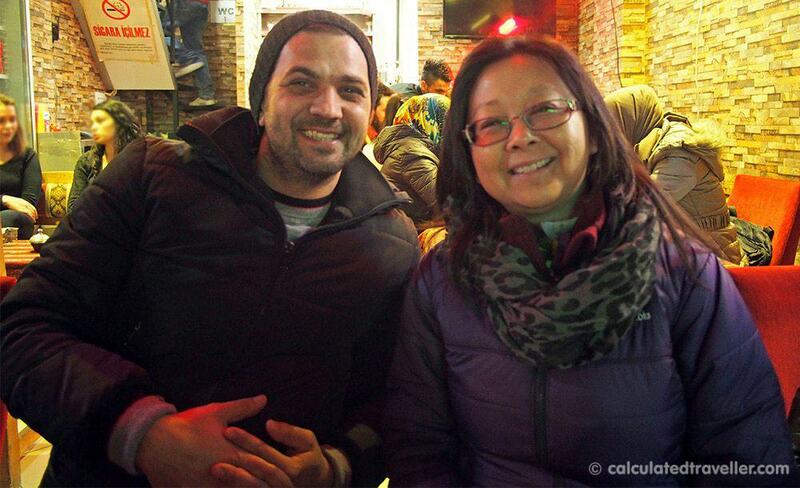 We had the opportunity to do just that on an Istanbul Food Tour! What to look for when choosing a food tour? Look for expert local guides. Small tour sizes of 12 or fewer participants. Check that all food stops are included in the prices so that you aren’t stuck with paying for extras. Can the tour accommodate food allergies? What time does the food tour take place? Is it a morning food tour when the markets are open or an evening food tour when the bars are open? Make sure it isn’t a shopping tour where you are encouraged to buy things along the way. If walking long distances is an issue, check the distance of the tour. Check weather and or trip cancellation policies. Of course, check reviews online before you book the Istanbul tour. We at Calculated Traveller have taken quite a few of food tours and highly recommend them. 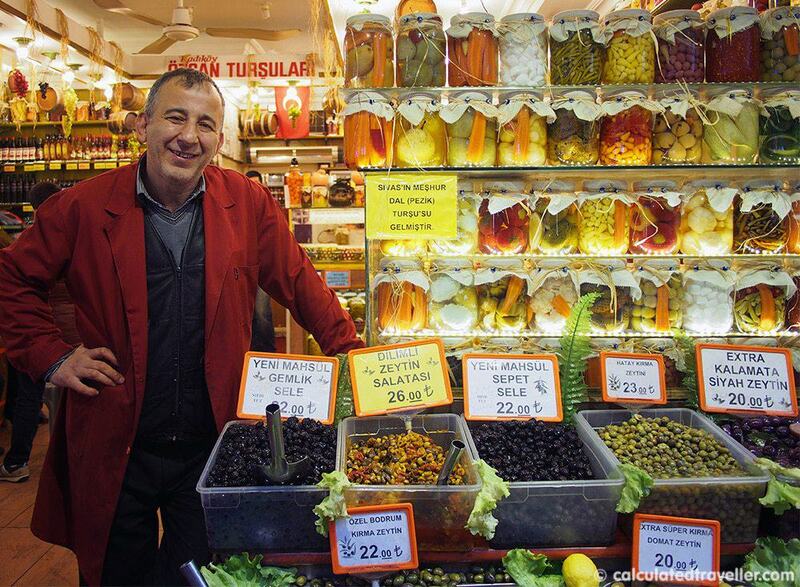 Are there good eats to be found in Istanbul? 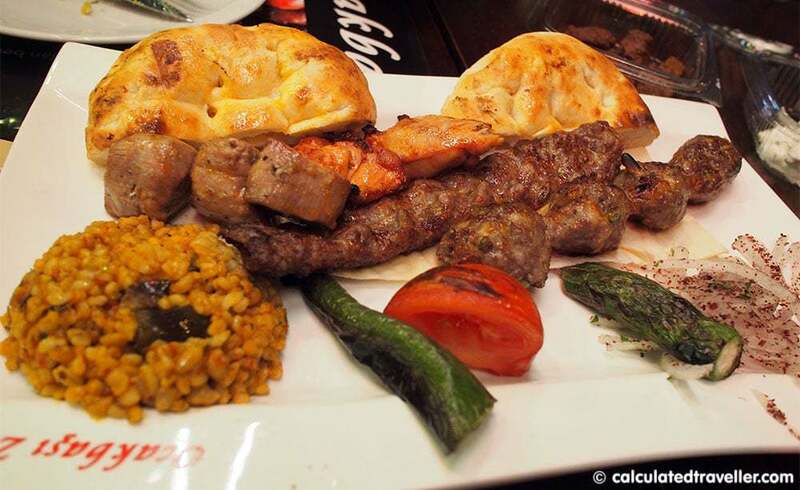 Most definitely Turkish food is incredible and they have a very lively food scene through the many Istanbul backstreets! Our walking tour in search for the best of Turkish Cuisine started with a ferry ride from the European to the Asian side of Istanbul and a nice hot cup of Turkish tea, cookies and conversation about the local food culture. Here’s a tip about the tea – it’s served black with sugar and no milk – AND it’s offered to you wherever you go. So don’t be surprised if you are just browsing in a shop and you get offered a cup of tea. The Turks are just an incredibly friendly group of people that way! With our very energetic and friendly guide Güney, we moved efficiently through the old city streets of busy Istanbul like a pro. 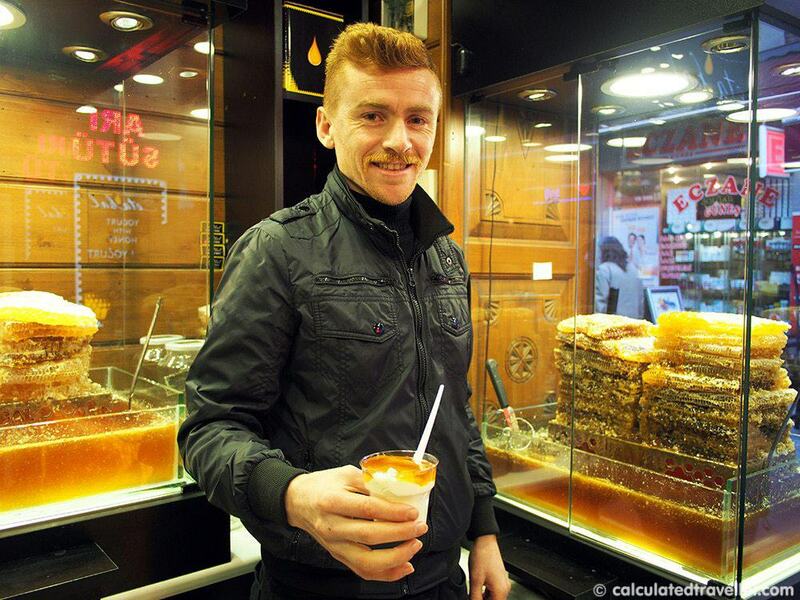 What foods should I try in Istanbul? 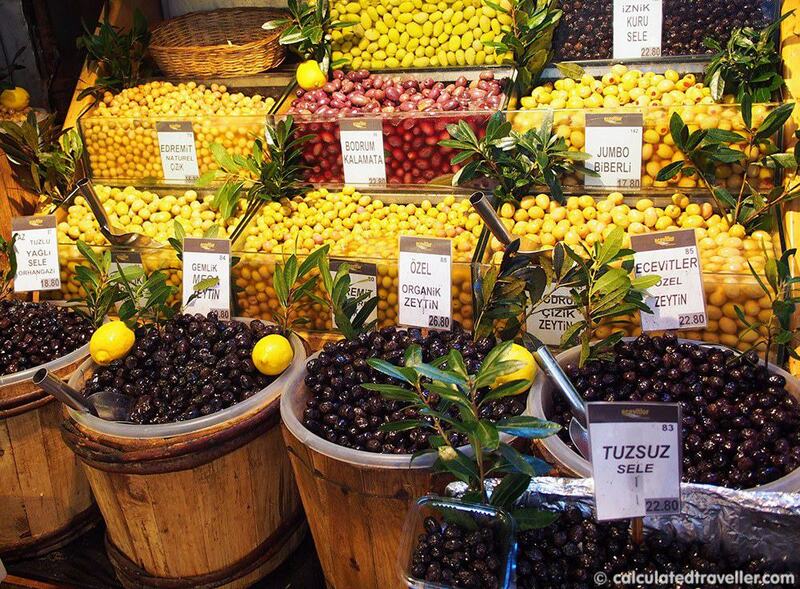 For about 4 hours our taste buds were on high alert as we visited the Istanbul food bazaar, market Istanbul, and scoured the back streets in search of new tastes, new smells and street food. 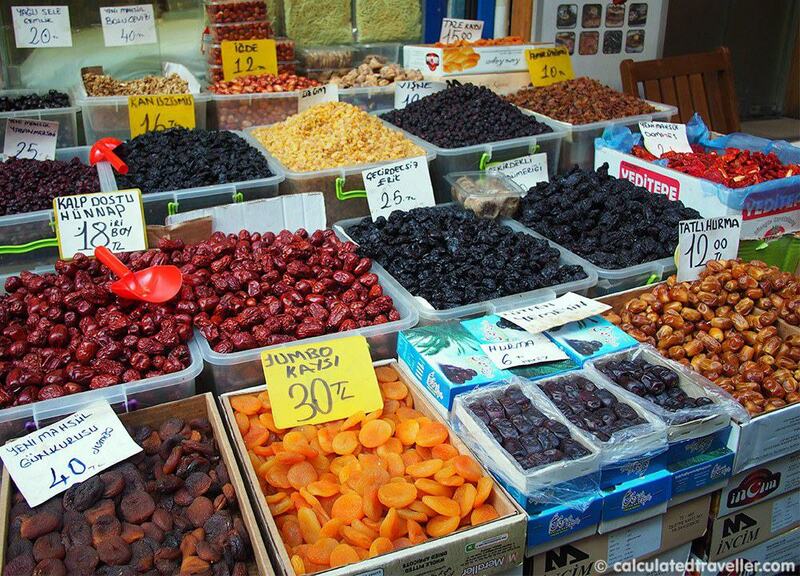 We sampled dried fruits, cured meats, grilled meats, cheeses, bread, and sweet and savoury treats — here are some of the highlights of our Istanbul food and culture walking tour. 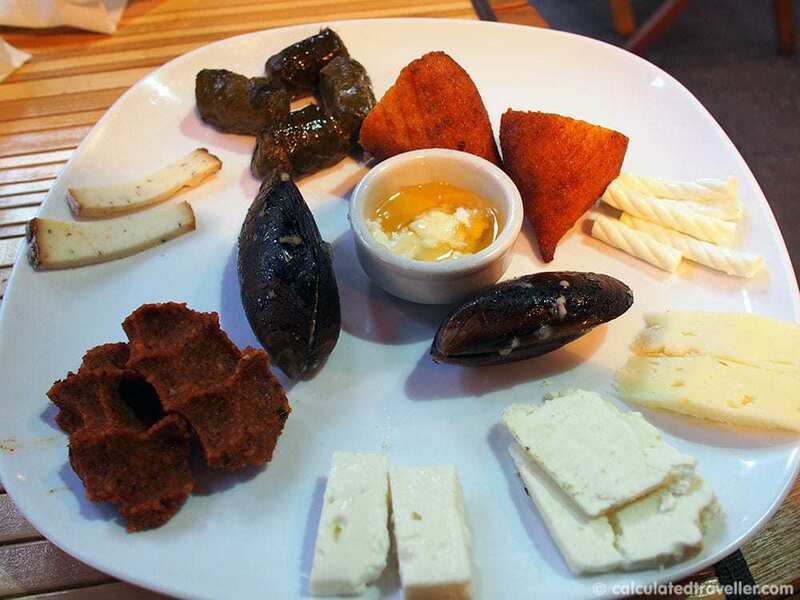 Want to make your own mezze platter at home? Check here for recipes. Warm honey right off the honeycomb and drizzled over the top of Turkish yoghurt. Sweet/sour and totally YUMMY! 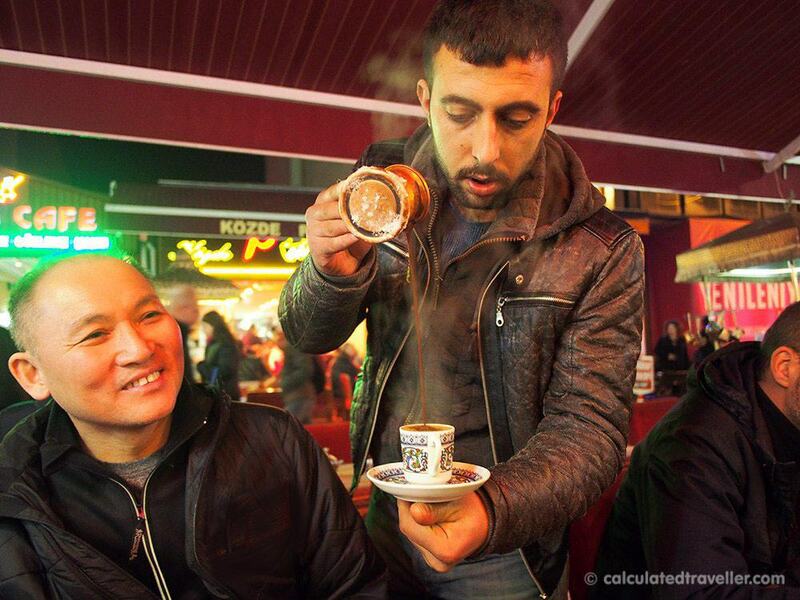 With our belly full and the evening drawing to a close we ended the night at a café for an authentic Turkish coffee served tableside with Güney — no longer our guide, but now a new friend. Our tour was a true memory that will last a lifetime. Wear comfortable shoes. There is a lot of walking, and many of the streets are cobblestone. Arrive early in case you have trouble finding the meeting location. Ensure you notify your guide of any food allergies, food restrictions before the tour. 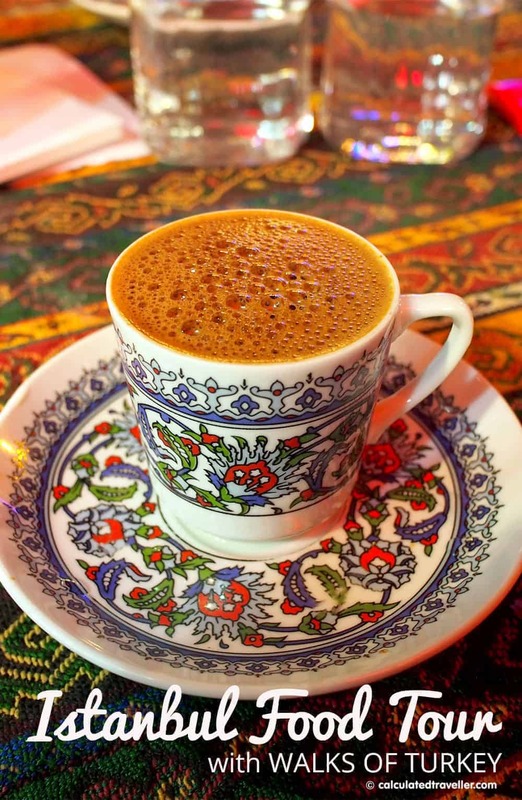 Lastly, don’t drink the “sludge” at the bottom of your Turkish coffee cup”. Put the saucer on top and carefully tip your cup upside down. Look at what’s remaining inside your cup and it will show you your fortune, or so Güney says! Spending time on a local tour for a few hours when you first arrive in a new place makes you feel more comfortable and confident to explore on your own after the tour ends. Food tours are excellent, and we’ve done many. It’s the easiest and fastest way of finding the best local eats in a strange city and avoid overpriced tourist fare. Do you look at food tours when you are planning a trip? What’s your experience taking walking tours? 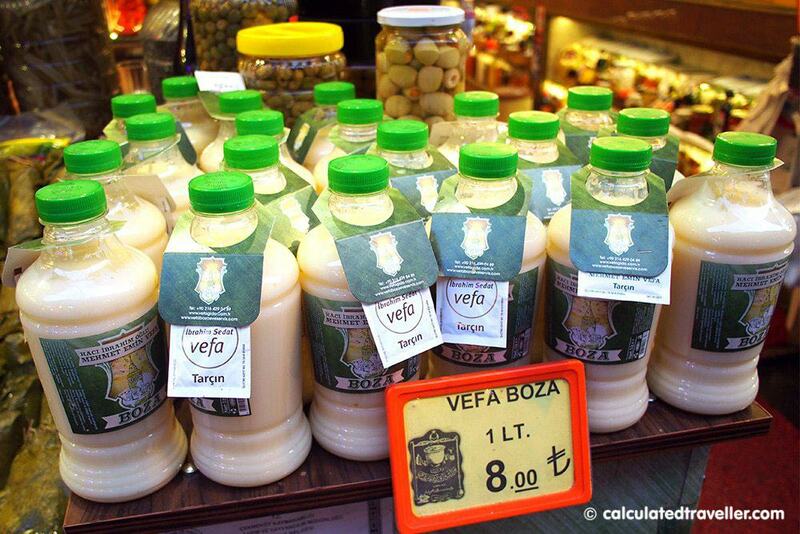 Have a look at Grand Bazaar and Spice Market of Istanbul Turkey in Photos as we continue our Istanbul visit. Tasty post! 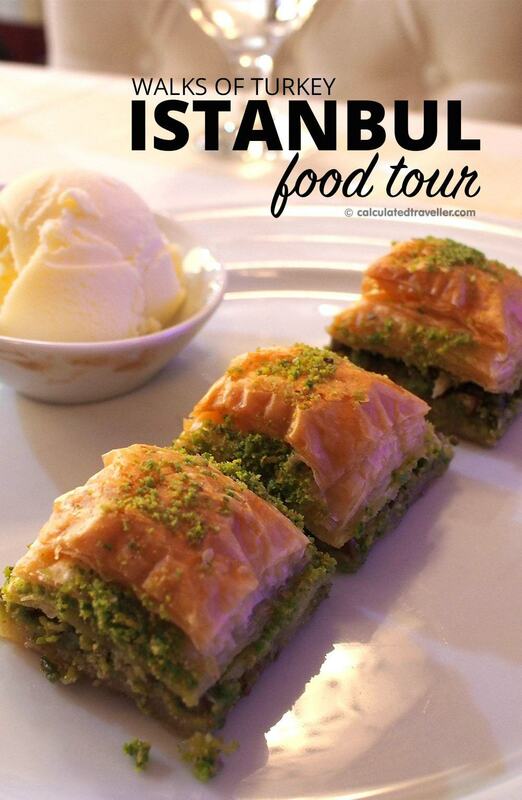 I’ll be in Istanbul in September so will definitely check this food tour out! OH MY GOSH. This is amazing, Mary! Yes, please! Food tours are the best aren’t they? Thanks for your comment!